There's been George Jones's story for the past forty years, a rough-and-tumble life of great music, heard living, and an incomparable relationship with his fans. Finally, in I Lived To Tell It All, George ones opens up and writes candidly and intimately about his failures and success, his losses and loves. In this no-holds-barred account, Jones admits how alcohol once ruled his life and perfomances (it wasn't for nothing that he was called "No Show Jones"); he confesses to a violent streak that ruined all too many friendships and relationships; and he details how he could always make a buck but never hold on to one. And he explains, in the most poignant, moving terms, how the love of a good woman can change a man, redeeem him, and save his life. 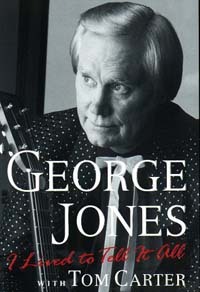 From his impoverished early years in East Texas and his hardscrabble first recordings, through his growing fame and volatile marriage to Tammy Wynette, to his latest acclaim as a clean-living, solid, "high-tech redneck", I Lived To Tell It All is George Jones—the good news, the bad news, and the just plain fun. It's a book as unforgettable as the man and his music. George Jones has been called the greatest country singer of our time. He lives in Nashville with his wife, Nancy. Tom Carter has coauthored bestselling books by Ralph Emery, Reba McEntire, Glen Campbell, and others. He lives in Nashville.